As quiet and beautiful as it was, Little Silver invited me into its folds with an introductory tale of tragedy. It was like starting a friendship with a punch in the gut; if you get through it, you’re best friends for life. I was 5 when I first stepped into our empty house with my brother and parents and the realtor. Holding my mom’s hand and looking down at the orange shag wall-to-wall carpet in the family room, I asked her in a whisper who had lived here before us. She told me about the family of three. One night earlier that summer, the son, 17 years old, had been doing 360s in his car on a joyride on one of the high school ball fields up the road. The gas cap popped off with a thunk, and to investigate the situation, he knelt down to check around the car, lighting a match to get a closer look. The explosion followed, and he and his girlfriend were helicoptered to the Brooklyn Burn Center where they both died the next morning. “But where did his parents go?” She told me that they moved down the road. A deliberate move, just to get out of this house. We resumed our walk-through behind the realtor as my small brain ran that scene over and over. I tried to picture his parents. My thoughts returned to them often throughout the years as a totem of tragedy. What was their life like now? Did they talk to each other or did they live in silence? I wondered which house down the street contained their sorrow. A couple of years later when I sold girl scout cookies door-to-door, there were two houses that never answered in all the years I knocked. The brush got thicker and wilder as I neared those houses by the woodsy bird sanctuary and I crossed through lots of thicket to get to those doors with seemingly no-one behind them. But a car in the driveway, always. Maybe they don’t answer the door to little kids. Maybe they can’t, I thought. Our house that had been marked by tragedy continued on its protracted-tragic schedule, though never again as dramatically as in the manner to which I’d been introduced to it. 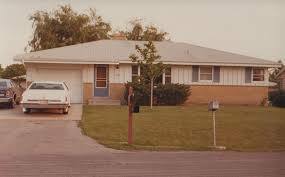 My brother and I loved our ranch-style home, same as all the others on our street, and had lots of happy times there. But all lives have sorrow and secrets, and many of ours incubated in that house. My mother immediately named it ‘The Turning Point’; months before she would separate from my father, she announced a little too excitedly, “So much changes here!” It fell into some disrepair soon after we moved in, since we lived there for only a year before Connie left Atkin, and due to the lawyer fees and costs of separation and divorce, maintaining the house and renting an apartment, neither of them had the funds to fix much. We loved it so much, we didn’t even notice. We were kids, we had circuitous hallways, we had a wild, overgrown yard to run around in, and we had the stories in our heads.